It is hard to believe that almost a month has passed since I have been back to my Montana. Not a lot of down time thus far, as this year, we had a BIG project going. My research into the way things are preserved in the fossil record has not only shown a lot of surprises, but has revealed some unexpected patterns. We have found that our chances of recovering both tissues and cells from dinosaur bone, as well as any molecular information, are greatly enhanced by examining the bone as soon as possible after it comes out of the ground. 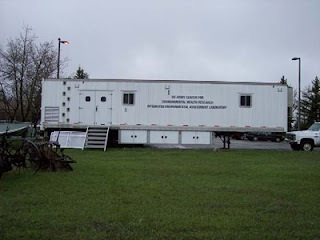 So, on the strength of that finding, NCSU and the North Carolina Museum of Natural Sciences found and purchased a 48 ft semi trailer that had been used previously as a wet lab. I was able to get a lot of equipment for the lab from donations (Glaxo Smith Kline and Roche) and from my Packard Foundation Fellowship. This is the trailer as it looked when it pulled into Bozeman, ready for its remodel. 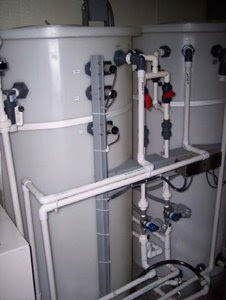 Elaborate filtration and monitoring system, with lots,and I mean LOTS of plumbing. Tim Cleland and Liz Johnson. It was amazing.The trailer had been used previously to me by an investigator at NCSU who was involved in a fish ecology project. 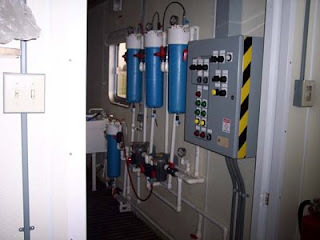 The trailer was extensively adapted to this, with a very specialized water system, capable of drawing in lake or river water, and passing it through a series of water treatment filters. Then, it would be put into large storage tanks where the water was constantly monitored through a complex system of knobs and gauges to maintain pH, oxygenation and other qualities. Then, it was specially reinforced with steel to hold all that water weight. And there was a very large double sink system, again supported by steel. So, the first week that I was in Bozeman was spent ripping. My destructive genes were in full operation, and I got to use all kinds of ‘guy’ tools—saws and drills and screw guns and the like—to help dismantle this system. My excitement was tempered a little bit when we found that the water system had not been fully drained since its last use, several years prior to our purchase. So, most of these tubes still had pressurized water in them, and in that water, there had been ample time for microbial growth. Ugh. As we sawed into the old plumbing, brown thick sludge that smelled like sewage came squirting out…..ok, GUSHING out….all over everything, including my hair and clothes. Ugh. 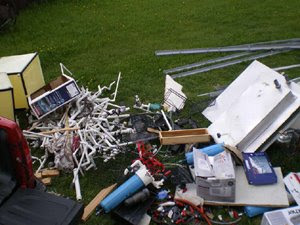 Debris from the trailer. Yes, we took this all out, one piece at a time. This is not something that grad school ever prepared me for, again. On days like these, or when sawing rotten ostrich legs and the like, I find myself truly wondering what grad school DID prepare me for???? Of course, nothing went as smoothly in reality as it did in my imagination. In the back of the trailer they had a 200 gallon water tank that would carry potable water to a small sink for dishwashing, and to the bathroom sink. However, when we put in water, it sprung a giant leak, completely filling the bed it sat in, and all the tubes and pipes, with water. The tank was specially made, and we REALLY didn’t want to replace it (and all the pipes and plumbing associated) so we tried one epoxy after another, each time convinced it would hold…and it did, sorta, except for one small leak that moved out of the line of epoxy each time we tried. So, after many valiant attempts, out came the tank. In pieces, because they had apparently built the bathroom walls around the tank. As you can tell, this was a bigger process than we had thought..always is. Always something…. The floor from the trailer was pretty shot, with the water tanks and steel supports, so we laid new subfloor, and then got tile from the local big box stores. I helped with laying subfloor, and thought that the next day I would go get a linoleum squisher thingy..(note….I write my papers scientifically, but I don’t talk that way). Once again Bob surprised me, because when I came in the next day, early, the floor was done. 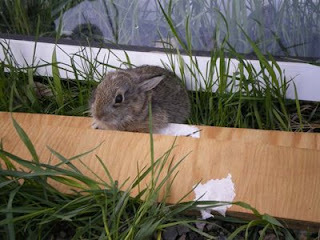 Bob laid it and then squished it down with a rolling pin on his hands and knees. Sheesh. Some guys have all the fun. We then built special supports for the two new water tanks that will feed our ultra pure water system, and Ben got the job of following in Bob’s footsteps with the linoleum glue and rolling pin. We also had to order countertops, of course, that will be our lab benches. So Ben got that job too, building the frames on which the tops would sit. That is when I finally began to imagine the end product of all this work. We could actually see how big the lab would be, and how much room we would have for all the assays we will run on the new bone, and how much data we hope to collect from all this. It is hard to believe that this all came together in such an incredibly short period of time. It is a pretty historic thing, I guess, that marks the joint collaboration of four institutions, with one common goal, and that is to facilitate our understanding of the rock record, and the animals and plants that once shared this planet with us. And, finally it is starting to look real! Benches are in, and the laminar flow hood will provide us with clean space for extractions. But, the final, finishing touch was probably the most exciting for me…the NC Museum of Natural Sciences art staff designed a special logo for the side of the truck. It is beautiful, and they did a great job of really capturing what we are all about. And…we will probably have a little easier time in small town northern Montana towns, if we DON’T have a US Army logo on the outside. They can be a little touchy up there….. So, here it is, the finished product on the outside! Is that cool or what??? A tyrannosaur, a duck-bill, and the logos testifying to the joint effort here. 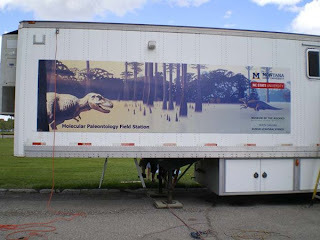 AND….the first ever, totally cool, dedicated Molecular Paleontology Field Station. So, it pulls out tonite, and we will have it on site tomorrow. I can’t wait to unpack the equipment, get it organized, and start working! Let’s just hope the dinosaurs cooperate.